Mouse spinal cord depicting bilateral demyelination of the lateral columns (arrows) in a mouse (age, strain, and gender unknown). Sciatic nerve myelin digestion chamber containing an intact axon between arrowheads in a rat (age, strain, and gender unknown). Demyelination of the nervous system is a specific term describing the active degeneration and phagocytosis of myelin wrappings of central and peripheral nerve fibers. Figure 1 and Figure 2 are examples of demyelination of myelin wrappings of central ( Figure 1 ) and peripheral ( Figure 2 ) nerve fibers of the mouse and rat spinal cord (arrows) and sciatic nerve, respectively. The arrowheads in Figure 2 show remnant axon. In this latter case the active myelin degeneration and phagocytosis were attributed to toxicity to a unique agrochemical. The term “demyelination” must be used carefully and not include the loss of myelin seen as a result of infarction of nervous tissue, more appropriately called “focal necrosis,” resulting from toxic or recognized infectious causes. A common error in diagnosis of demyelination relates to use of the term to describe artifactual neuropil vacuolation commonly seen in immersion formalin-fixed neural tissue, or confusion with the important authentic neuropil vacuolation seen in intramyelinic edema. Demyelination may be primary of secondary. In primary demyelination, the axon is usually intact and may be preserved, especially if the myelin sheath is exclusively assaulted by the immune system with resulting phagocytosis (primary demyelination). In contrast, secondary demyelination is a common sequel to axonal injury and loss, such that axonopathy and demyelination often coexist as a result of axonal injury from classic axonopathic compounds such as organophosphate agents and acrylamide. In addition to demyelination resulting from multiple sclerosis in humans and the experimentally induced autoimmune encephalopathy of laboratory animals, rarely human immune-mediated demyelinating neuropathies occur during initial or maintenance treatment with immunomodulatory, immunosuppressive, or antineoplastic agents. Krinke and Zurbriggen (1997) have described a demyelination in the thoracic spinal cord of aging mice that was attributed to a strain of Theiler’s murine encephalomyelitis virus (TMEMV) using immunohistochemical identification of the agent in their material. 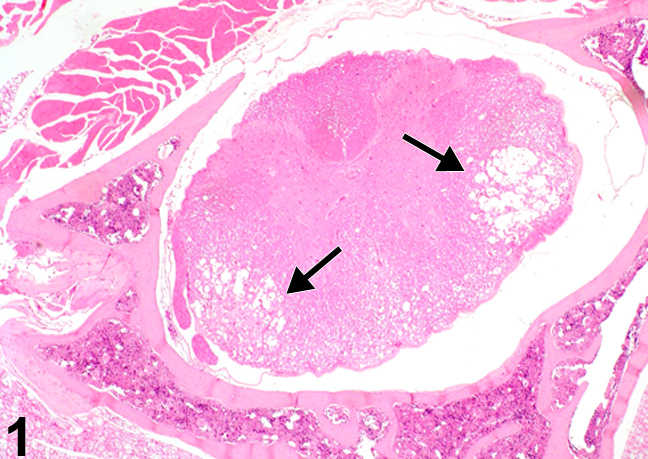 Prominent bilateral lesions of the spinal cord from their studies are shown in Figure 1 (arrows). However, TMEMV is uncommon in barrier-raised laboratory mice, particularly in North America (PB Little, personal communication with C Clifford, Charles River Laboratories). In NTP studies where demyelination cannot be differentiated from intramyelinic edema or axonopathy under light microscopy, the lesion should be diagnosed as white matter vacuolation. This should be followed by special evaluation by a neuropathologist. When present in NTP studies, this lesion should be graded and the subsite noted. Krinke GJ, Zurbriggen A. 1997. Spontaneous demyelinating myelopathy in aging laboratory mice. Exp Toxicol Pathol 49:501-503. Stübgen JP. 2011. Drug-induced dysimmune demyelinating neuropathies. J Neurol Sci 307:1-8. Schaumburg HH, Spencer PS. 1979. Toxic neuropathies. Neurology 29:429-431. Kushlaf HA. 2011. 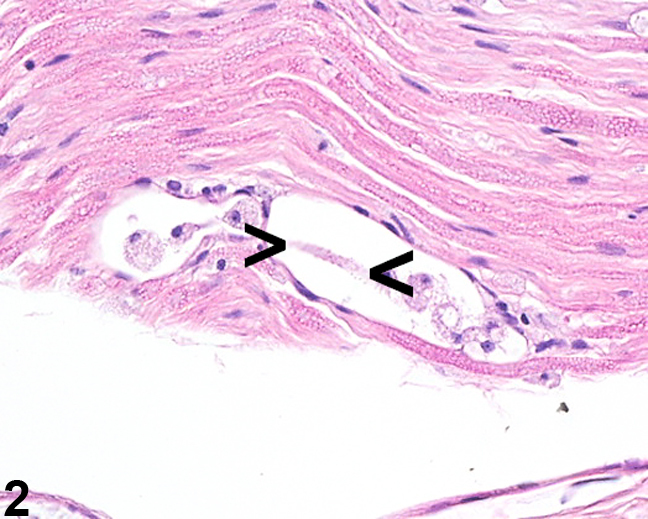 Emerging toxic neuropathies and myopathies. Neurol Clin 29:679-687. Carozzi VA, Canta A, Oggioni N, Sala B, Chiorazzi A, Meregalli C, Bossi M, Marmiroli P, Cavaletti G. 2010. Neurophysiological and neuropathological characterization of new murine models of chemotherapy-induced chronic peripheral neuropathies. Exp Neurol 226:301-309.